The History of Hale Project has been doing some fascinating work looking at the whole Parish. Check out their website here. Check out our pages on the history of St George’s, St John’s and St Mark’s. The tithing of Badshot was one of the ten tithings which comprised the hundred of Farnham, itself the westernmost hundred in the county of Surrey. In the medieval period, the only village in the tithing was Badshot with a very small hamlet at Hale. The rest of the tithing was common grazing, the enclosure of which over the centuries has given a distinct character to the various areas. Today, there are a number of villages and communities in the old area of tithing, including Farnham Park, Hoghatch, Law Day Place & Heathyfields, Sandy Hill & the Common, Heath End, Badshot Lea, Weybourne, Upper Hale and Hale. 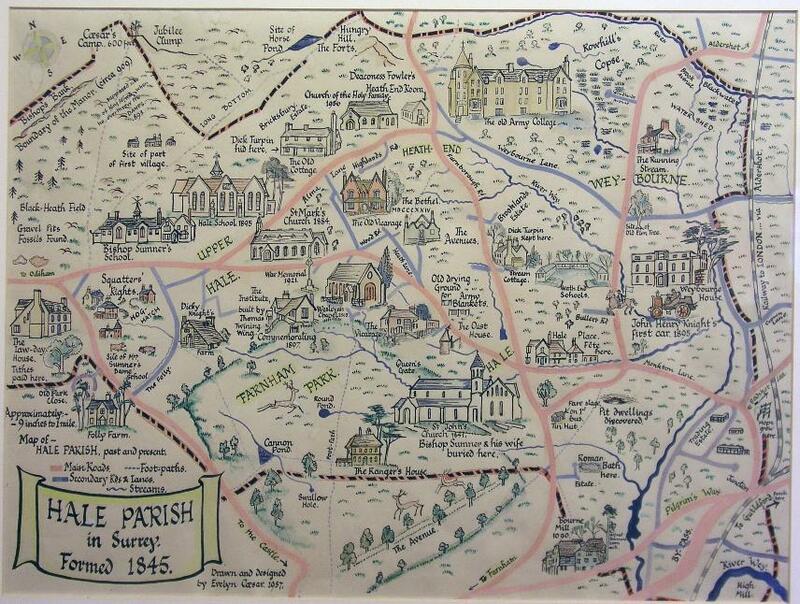 Evelyn Caesar’s pictorial map of the part of Badshot tithing which became Hale Parish. Taken with permission from the Hale History Project Website.